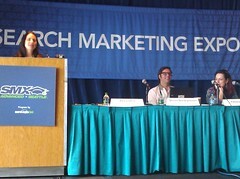 Tamara Adlin, President, Adlin, Inc.
Dennis Goedegebuure, Director SEO, eBay, Inc.
Vanessa is saying this is going to be the best session at SMX Advanced. She tells the people in the back to come closer, but she understands if they don’t want to be too close to the crazy people aka speakers. She’s telling everyone she began speaking about this persona topic while tipsy at a party with some of the speakers. Two out of the three people up there have written a book (just a little nugget for you). Tamara Adlin is up first. She says neither her nor Vanessa don’t actually do what they are hired to do — they are hired for SEO, but they come in to “uncluster F” the business. They ask them about business goals and brand; they always want to skip that, but then realize that they need to examine it. Personas are great because it allows companies to ID that one persona may be more important than another. There’s a difference between a searcher persona and a product persona are different in some cases. A user persona like “Marlene” and “Phil” might be at the site and we want them to do something. A searcher persona is about getting those eyeballs to the site. How are they thinking when they are first starting to look for this thing? They may be Phil or Marlene once they arrive. “We are not sending people to the moon, we are selling shoes” — creating personas doesn’t have to be difficult to serve a purpose. Dennis Goedegebuure from eBay is up. Vanessa is asking if anyone can pronounce his last name, and says she’ll never pronounce his last name when introducing him. Dennis starts off by introducing himself and gives an inaudible pronunciation of his last name. He’s is from Amsterdam. He’s showing pictures of a giant plate of meat and vodka saying that’s what he likes — but he also is trying to make a point. He is saying this is data that makes up who he is as a persona: eBay, BBQ, travel, vodka, Amsterdam and photography. He is giving stats about a category of people who are passionate about photography. Says most people can fall into this. He then goes into stats about how this type of person buys online — lots of research, price is key, brand loyalty is a factor and so on. Says you can now connect the dots — person data and keyword data to build an ultimate persona. Keep a network of keywords. Cluster the keyword networks together. At eBay, they came up with seven unique clusters of user persona. And then they did testing. They tested headlines for two of the three personas. How does this relate to SEO? Different user segments will react differently to things like snippets on the SERP. Keyword persona data gives a timely measurement of user intent. Keyword persona is different from but complementary to user demographic persona. Segmenting keyword personas gives opportunities to optimize further. Vanessa is up to talk. She says SEO goes beyond how we think about SEO. It’s a larger process, finding who your audience is and engaging with them. SEO and UX overlap often and they both have conversion. She finds that a lot of people don’t know what their business goals are aside from traffic. What do you want people to do? Engage? Convert? She says do a Post-It note exercise — use one persona per sticky note; include the person and the goal for that person. Come up with categories of what it is that personas want. Stop thinking about the users and start thinking like them. Put your skeletons of users in a persona list next, her example has “Becky Busy,” “Pete Purposeful” and “Olivia Ohm” (yoga client). How likely is this searcher to convert? How difficult/easy would it be to add features to the site to address this searcher need? In Tamara’s book, she gives tips on prioritizing personas. For every keyword cluster and persona, what is the task that the user wants to accomplish? How can you help someone accomplish the task? What can you do the persona might not ask for? Business goals related to the task. For keyword clusters, she would set a category in analytic of this category to track it. Now there are time for questions. Tamara jumps in for a final thought and says you can BS Google anymore — you have to have real value. And this is what this process is all about. Q: Do you find a problem with clustering that certain keywords apply to many personas? Vanessa: She approaches it to map content. She decides to have a landing page for certain keywords with high volume, and then uses supporting pages to speak to specific personas for the more targeted keyword strains. She might say, these are the four personas that might land on this particular page. Two may be important and two might not be; give call-to-action for those two that are important. Dennis chimes in to say to make the personas that bring in revenue as the most important. Q: How do you use data to refine personas? Vanessa: Once she has all the sticky notes and thinks the audience is interested in one thing, and then finds that no one searches for that thing. Once you have the clusters, look at analytics data by cluster to see if any are converting. Tamara: Use the personas to structure your research as well. Q: How much time do you allow in the project (a redesign for example) if you find the client has no idea about personas, goals, etc.? Vanessa: Always do the research before you approach the project – must understand the audience and goals to do the type of SEO she believes in. She gives questions to the clients and then based on the answers she gets back, she knows how much more time they need to spend on the project. She says it can be a couple days for this process. Dennis says it’s based on a lot of factors like knowledge level of the client, site scope, size of team, etc.